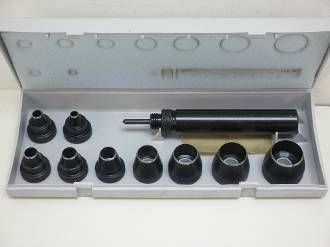 This handy and versatile kit contains threaded handle with self-centering pointed plunger. This threaded handle will acommodate nine interchangeable threaded cutting tubes. The punches in this set will cleanly cut leather, canvas, rubber, paper, plastics and other soft materials. The self-centering point makes these punches ideal for cutting concentric washers in small quantities by hand. Sizes of punches listed below. All cutting edges properly hardened. The only professional tool like it. Comes in a sturdy plastic box for storage.